Research in automatic text plagiarism detection focuses on algorithms that compare suspicious documents against a collection of reference documents. Recent approaches perform well in identifying copied or modified foreign sections, but they assume a closed world where a reference collection is given. 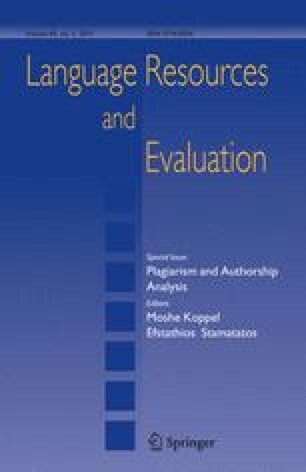 This article investigates the question whether plagiarism can be detected by a computer program if no reference can be provided, e.g., if the foreign sections stem from a book that is not available in digital form. We call this problem class intrinsic plagiarism analysis; it is closely related to the problem of authorship verification. Our contributions are threefold. (1) We organize the algorithmic building blocks for intrinsic plagiarism analysis and authorship verification and survey the state of the art. (2) We show how the meta learning approach of Koppel and Schler, termed “unmasking”, can be employed to post-process unreliable stylometric analysis results. (3) We operationalize and evaluate an analysis chain that combines document chunking, style model computation, one-class classification, and meta learning. Argamon, S., Šarić, M., & Stein, S. S. (2003). Style mining of electronic messages for multiple authorship discrimination: First results. In KDD ’03: Proceedings of the ninth ACM SIGKDD international conference on knowledge discovery and data mining (pp. 475–480). New York, NY, USA: ACM. ISBN 1-58113-737-0. doi: 10.1145/956750.956805. Henzinger, M. (2006). Finding near-duplicate web pages: A large-scale evaluation of algorithms. In SIGIR ’06: Proceedings of the 29th annual international ACM SIGIR conference on research and development in information retrieval (pp. 284–291). New York, NY, USA: ACM Press. ISBN 1-59593-369-7. doi: 10.1145/1148170.1148222. Holmes, D. I. (1998). The evolution of stylometry in humanities scholarship. Literary and Linguistic, 13(3), 111–117. doi: 10.1093/llc/13.3.111. Juola, P. (2006). Authorship attribution. Foundation Trends Information Retrieval 1(3), 233–334, ISSN 1554-0669. doi: 10.1561/1500000005. Kjell, B., Woods Addison, W., & Frieder, O. (1994). Discrimination of authorship using visualization. Information Processing and Management, 30(1), 141–150. ISSN 0306-4573. doi: 10.1016/0306-4573(94)90029-9. Koppel, M., & Schler, J. (2004a). Authorship verification as a one-class classification problem. In ICML ’04: Proceedings of the twenty-first international conference on Machine learning (pp. 62). New York, NY, USA: ACM. ISBN 1-58113-828-5. doi: 10.1145/1015330.1015448. Koppel, M., Schler, J., Argamon, S., & Messeri, E. (2006). Authorship attribution with thousands of candidate authors. In Proceedings of the 29th annual international ACM SIGIR conference on research and development in information retrieval (pp. 659–660). New York, NY, USA: ACM. ISBN 1-59593-369-7. doi: 10.1145/1148170.1148304. Potthast, M., Eiselt, A., Stein, B., Barròn Cedeño, A., & Rosso, P. (Eds.). (2009). Webis at Bauhaus-Universität Weimar and NLEL at Universidad Polytécnica de Valencia. PAN Plagiarism Corpus 2009 (PAN-PC-09). http://www.webis.de/research/corpora. Sanderson, C., & Guenter, S. (2006a). On authorship attribution via markov chains and sequence kernels. In Pattern recognition, 2006. ICPR 2006. 18th international conference on (vol. 3, pp. 437–440). doi: 10.1109/ICPR.2006.899. Sanderson, C., & Guenter, S. (2006b). Short text authorship attribution via sequence kernels, markov chains and author unmasking: An investigation. In Proceedings of the 2006 Conference on Empirical Methods in Natural Language Processing (pp. 482–491). URL http://acl.ldc.upenn.edu/W/W06/W06-1657.pdf. Stamatatos, E. (2007). Author identification using imbalanced and limited training texts. In A. M. Tjoa & R. R. Wagner (Eds. ), 18th international conference on database and expert systems applications (DEXA 07) (pp. 237–241). IEEE, September 2007. ISBN 0-7695-2932-1. doi: 10.1109/DEXA.2007.37. Stein, B., & Meyer zu Eissen, S. (2007). Intrinsic plagiarism analysis with meta learning. In B. Stein, M. Koppel, & E. Stamatatos (Eds. ), SIGIR workshop workshop on plagiarism analysis, authorship identification, and near-duplicate detection (PAN 07) (pp. 45–50). CEUR-WS.org, July 2007. URL http://ceur-ws.org/Vol-276. Stein, B., & Meyer zu Eissen, S. (2007). Topic-identifikation: Formalisierung, analyse und neue Verfahren. KI—Künstliche Intelligenz, 3, 16–22. ISSN 0933-1875. URL http://www.kuenstliche-intelligenz.de/index.php?id=7758. Stein, B., Lipka, N., & Meyer zu Eissen, S. (2008). Meta analysis within authorship verification. In A. M. Tjoa & R. R. Wagner (Eds. ), 19th international conference on database and expert systems applications (DEXA 08) (pp. 34–39). IEEE, September 2008. ISBN 978-0-7695-3299-8. doi: 10.1109/DEXA.2008.20. van Halteren, H. (2004). Linguistic profiling for author recognition and verification. In ACL ’04: Proceedings of the 42nd annual meeting on association for computational linguistics (pp. 199). Morristown, NJ, USA: Association for Computational Linguistics. doi: 10.3115/1218955.1218981. van Halteren, H. (2007). Author verification by linguistic profiling: An exploration of the parameter space. ACM Transactions on Speech and Language Processing, 4(1), 1. ISSN 1550-4875. doi: 10.1145/1187415.1187416.